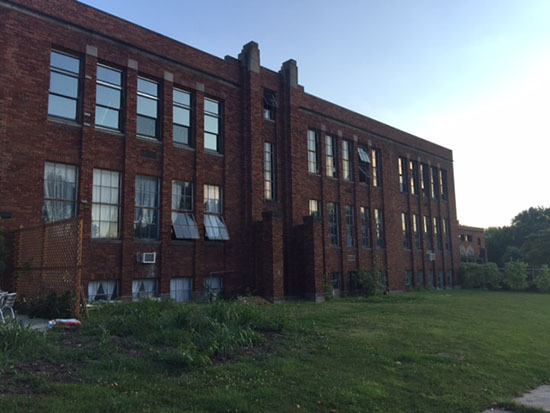 The Milton School in Alton, Illinois no longer operates as a functional school but many say that children are still seen and heard throughout the building. The Milton School in Alton, Illinois is one of the most notable haunted locations in the area, but are the ghostly tales true? The school was once a "must see" location for paranormal investigators and was even visited by the Syfy television show Ghost Hunters. However, in more recent years the paranormal investigations stopped and the current owners focused on giving the school new life, with several businesses and residential apartments now occupying the space. A new-found interest in the building began this Summer when the American Hauntings Podcast featured the Milton School in their first season. According to the school's owner, the podcast resulted in numerous phone calls inquiring about the haunted lore. In response, she organized and allowed a small number of people to tour select places inside the building for a chance to experience the unexplained first hand. Before we explore the events of investigation, you need a bit of back story on this notorious building. The most popular haunted tale is related to a brutal killing. For years, local legend said a young student named Mary was staying late one day after school to work on a project when one of the janitors saw an opportunity to act out his sick fantasies. He victimized the young girl by dragging her down to the locker rooms, violating her, and then killing her. Sometime after, the janitor was found in the school hanging from the ceiling with a note that read, "I did it." It all sounds incredibly grotesque and frightening, worthy of a famous haunting, right? The problem is, the story is 100% false. You see, that is the mystery of the Milton School. The stories of murder, torture, and suicide don't stem from any historical facts but instead the imagination of those who have experienced strange happenings in the building, which aren't in short supply. Over the years many people have reported hearing children's voices when no children were present, noticing items moving from place to place with no human hand guiding them, and the uneasy feeling of being watched. The school's popularity with the paranormal has grown over the years and brings us to the most recent investigation. My own interest in the Milton reaches beyond the paranormal and into a bit of family history. My great grandmother attended Milton School and was also acquainted with the family of Robert Wadlow, the most famous former Milton student and world's tallest man. Walking the halls of a grandmother I never knew and Alton's giant was something I looked forward to experiencing and if I found a few ghosts along the way it was a bonus. The night began with the group gathering in Maeva's Coffee, one of the several businesses now occupying the school. A brief history was given of the building. The winding hallways started out in 1904 as a small brick school house and over the years formed into a robust elementary school until it was closed in the late 1980s. The stories of supernatural happenings began even before the doors closed with students reporting strange noises and frightening encounters with something otherworldly. In the 1990s, paranormal groups began to explore the building and continued to do so until a few years ago when the Milton School took on a new purpose as a space for entrepreneurs in small business. After our meet and greet we headed to the gymnasium which now holds random furniture and building supplies. The once busy bleachers have seen better days, with many sections unsafe for walking, making it a place you don't want to explore in the dark. While in the gym our group took some time to conduct an EVP (electronic voice phenomenon) session. Stories of children's voices being heard were told and during a moment of silence we heard a strange noise which I can only describe as humming. The humming had a purposeful tune or rhythm to it but we never could find the source. It continued off and on for a few minutes and then faded until it stopped completely. I can't swear the humming was anything paranormal. Something to keep in mind is the condition of the building. There are holes and broken windows throughout the yet-to-be rehabbed portions of the building which lets the sounds of the outdoors inside. Sounds also tend to carry in the school, as you would expect in an abandoned building. Still, it appeared no one in our group created the humming and it sounded as though it was coming from the gym and not an outside source. Our next stop was the locker room area of the school, an eerie and unnaturally quiet location. It's clear why people have been spooked here, as it would be easy to let your mind wonder. A few spikes on the K-2 meter, signaling a fluctuating electromagnetic field, had us interested for a bit but besides gigantic spiders, there appeared to be nothing else joining us in the area. However, as the group began to leave and journey back upstairs my friend and I held back for a second. The EMF appeared to jump again and we received a few words on the Ghost Radar app (which I always take with a grain of salt). The words included the name "Dan" and "Football." As I shouted to the tour guide to get her attention the word "Return" flashed on the app. 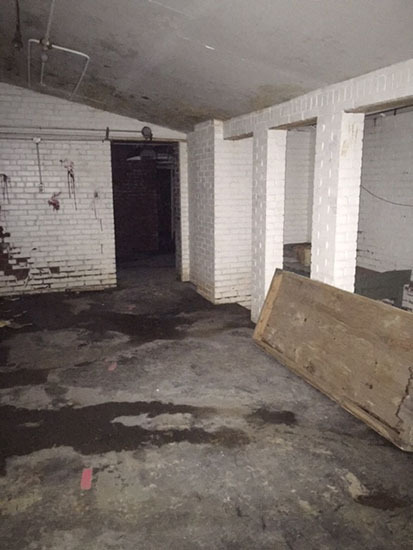 Rumored to be one of the most haunted parts of the building, the old locker rooms at Milton School have a history of frightening visitors. Realizing that perhaps something abnormal was occurring, the group returned just like the app said and we continued to have fluctuating EMF. The owner stated that a man named Dan had resided in the building for a while and was also a football coach, something that seemed to correlate with the words spoken on the Ghost Radar App. It was interesting that when speaking of Dan the EMF did increase, as it did when the tour guide would turn her back to the K-2 device, only to decrease in EMF when she approached it. I won't swear that we experienced anything paranormal but it was interesting and at the very least the words on the app were strangely coincidental. I ended my time at the Milton in the old boiler room. Our group was told about a janitor in the 1920s who suffered a heart attack and died in the building. Nothing like a good death to get the senses peaked. It was interesting that the K-2 meters fluctuated from low to high with no known source to cause the fluctuations. However, I must keep in mind that almost 20 people were hovering in a close space. Even assuming we all had our cell phones on airplane mode, other sources such as smart watches and old wiring could affect the EMF. Using the Ghost Radar app, there were a couple words that came through including: "France" and "Europe" and when asked if those words were referring to a vacation one of the words in response was "Fact." I didn't think much of it until I did some quick searches for the Milton School in old Alton newspapers. One of the stories that popped up was an article from the Alton Evening Telegraph dated June 17, 1939 regarding Edgar Cook, a teacher at Milton School who was getting ready to sail on the SS Normandie to vacation in France. Could the energy of Mr. Cook still be at the Milton School? Anything is possible and if I was going on a European vacation I would want to brag about it too. The truth is, you don't need a horrific event for a building to harbor energy or spirits. Have you ever spent the afternoon with a five-year-old? They have enough energy to last a lifetime, or in the case of the Milton, several lifetimes. If you think about it, the school was in operation for over 80 years. The amount of hopes, dreams, tears, and fears that came through the building is unmeasurable. It's quite likely that the unexplained occurrences in the building might be imprints of the past that at times replay. Milton School saw thousands of students through childhood, arguable some of the best and worst times of their lives. It's easy to believe that something might still linger the halls. Will you run into the spirit of a poor murdered young girl? Probably not, but you may run into glimpses of the energy that once existed here and that's something worth exploring. Check out the American Hauntings Podcast (Season 1, Episode 3) for more information on the Milton School, available on your favorite podcast app or at www.americanhauntingspodcast.com. You can also find information on the Milton School in Haunted Alton by Troy Taylor. Copies of this publication as well as other Troy Taylor books can be found at www.prairieghosts.com. Currently no additional paranormal tours are scheduled at the Milton School but you can check out the building's stores, studios, & services during their business hours. If you're looking for haunted tours or investigations you can check out www.altonhauntings.com for more information on events in one of America's most haunted towns. In addition to Alton, American Hauntings hosts haunted history tours in: Carlinville, Chicago, Decatur, & Jacksonville, as well as overnight paranormal investigations across the country. You can find out more information about these events at www.prairieghosts.com.